Located in the Forum shopping centre, Oasis is a granite piece where water flows down a winding path across an outside court yard paved with stones, streams into a pool and rises up to a three-sided granite block inside the centre, to slowly flow along a channel cut in the coarse surface into another pool surrounding the block. Zoltan Popovits is a U.S. citizen of Hungarian origin. He has lived and worked in Finland since 1965. He is well-known for his experiments with materials and studies into conceptual dimensions. His oeuvre covers Pop Art and Surrealism, installation and temporary pieces as well as unadorned architectural works. His career in design has also been remarkable. He has worked at the Arabia ceramics factory and as a designer at Lapponia Jewelry. Oasis is one of his more recent pieces. It combines wonderful aesthetics of the material with a study of scale and our ability to perceive the world. In addition to varying scale the work includes such conceptual opposites as coarse/polished, organic/structured, closed/open and tranquil/dramatic. The work doesn't belong to the collections of the Helsinki Art Museum. 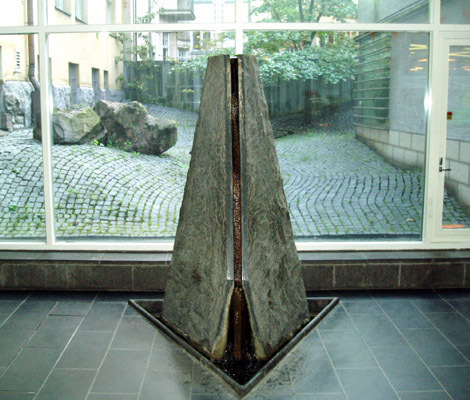 Popovits' other works include the fountain at Erottaja 9-11 and the pieces Earth and Air in shopping center in Itäkeskus.